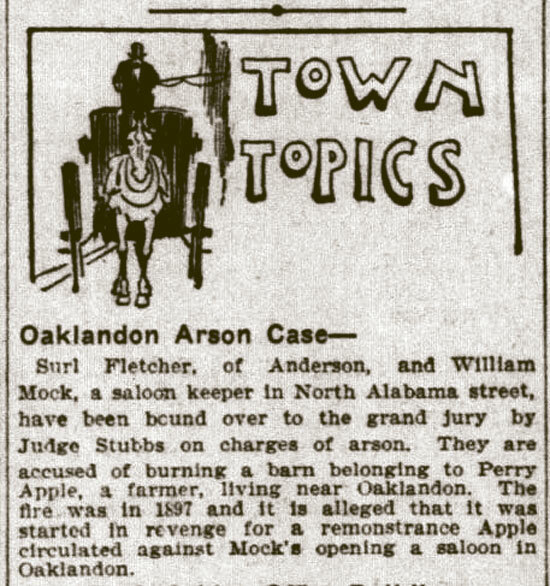 Oaklandon Arson Case— Burl Fletcher, of Anderson, and William Mock, a saloon keeper In North Alabama street, have been bound over to the grand Jury by Judge Stubbs on charges of arson. They are accused of burning a barn belonging to Perry Apple, a farmer, living near Oaklandon. The fire was in 1897 and it is alleged that it was started in revenge for a remonstrance Apple circulated against Mock's opening a saloon in Oaklandon.